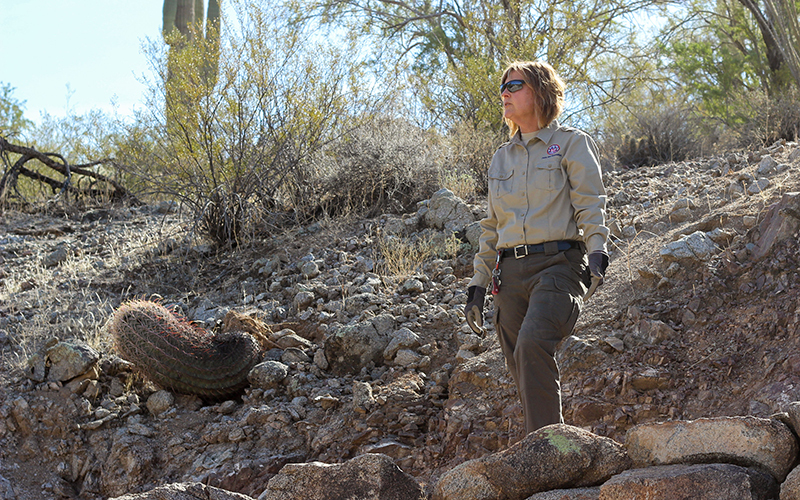 QUEEN CREEK – For the 500 miles of trails in the Maricopa County Park system, increasingly destructive monsoon storms are causing more erosion, more damage and potentially more costly repairs. Researchers predict the summer storms, likely driven by climate change, will become stronger and more intense in Arizona. For parks, storm damage affects everything from hiking to rescue efforts. 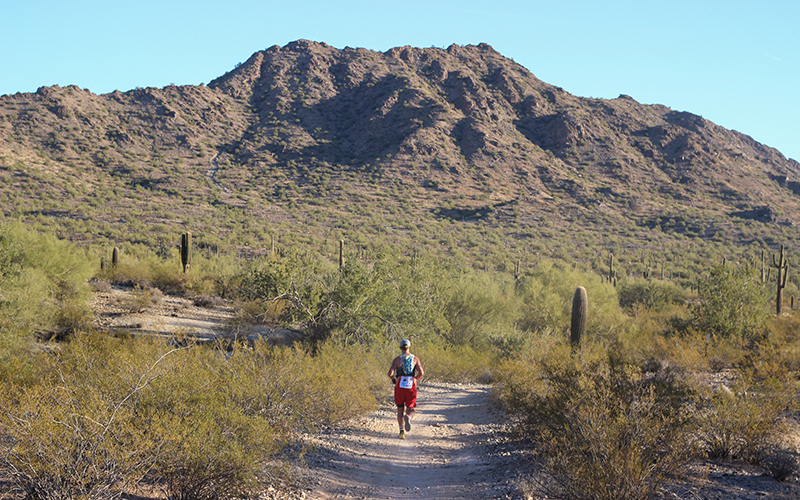 In 2019, Maricopa County officials predict they will need nearly $10 million for park maintenance for the system’s 11 parks and one outdoor center. “The power of water, it’s just amazing what water can do and how fast it comes off this mountain,” said Nikki Bunnell, a ranger at San Tan Mountain Regional Park in Queen Creek. She pointed to a deep rut cutting into a trail bend. But next year might be a problem anyway. Castro is an associate professor of hydrology and atmospheric sciences at the UA, but he also has researched monsoon-storm intensity for the U.S. Department of Defense. He predicts more dust storms, lightning strikes, flash floods and erosion. When runoff overwhelms or misses runoff routes, it cuts through the trails, making them narrower, uneven and littered with exposed, jagged rock. It also can wash the trails away completely. In Queen Creek, Bunnell manages the impact, assessing the severity of damage to different trails. Her main concern: Can she rescue people in distress? “We need to be able to get from point A to point B. If something is washed out that makes it impossible, then that would be a priority risk,” Bunnell said. Bunnell volunteered at the park before becoming a ranger, and she lives nearby. She pointed out that some “washes,” meant to divert water, had themselves eroded. While repairs can be effective for years, Bunnell also said water from “freak rainstorms,” can take their toll. Castro predicts this kind of storm will become more common. 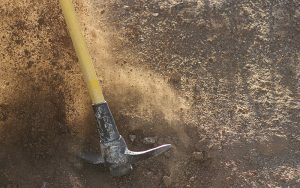 The Maricopa County Parks and Recreation Department has proposed increased fees to address park maintenance, which the county Board of Supervisors will vote on in late February. If approved, they could take effect this summer. The increases vary between an extra dollar for vehicle entry and new fees for early checkout at camping sites and bike access. According to the proposal, all new revenue will go directly toward the 120,000 acres of land in the parks system. 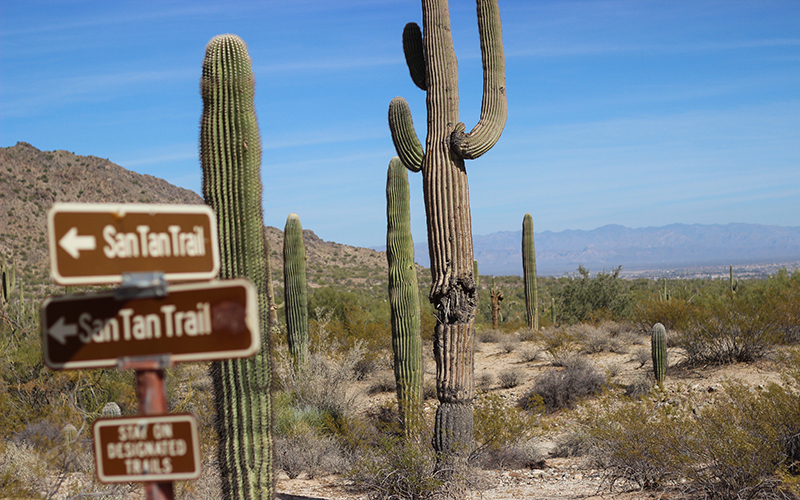 R.J. Cardin, parks and recreation director for Maricopa County, noted that entrance fees have not gone up in 11 years. He said park design is still the best defense against damage from severe weather, including monsoon storms. Cardin cited his department’s trail management manual, which prioritizes repairing impassable washouts and correcting significant trail damage. Erosion causes both. Many park visitors who notice storm damage volunteer their time – 100,000 hours in 2017 – to help the worker deficit. 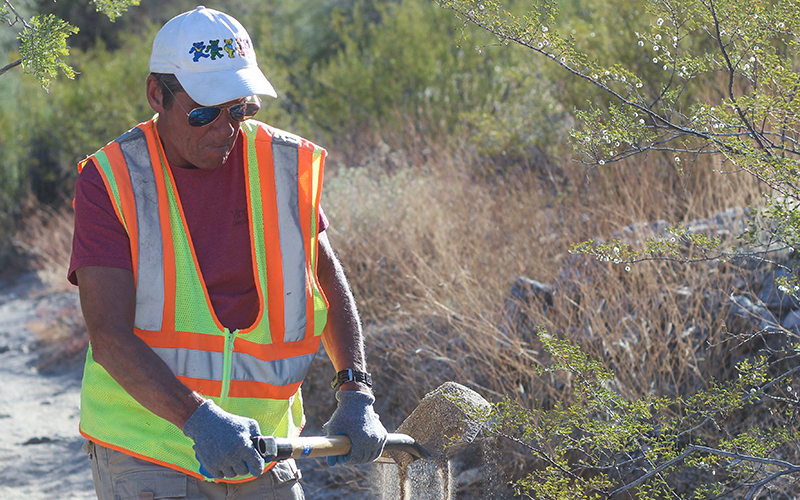 Chris Hawthorne, a member of the San Tan Trail Runners group, volunteered a day in late January to work on eroded trails. George Brown, another volunteer, described their efforts as building pyramids to last forever. “It’s always nice to come back and see your work still standing, despite monsoons,” he said. 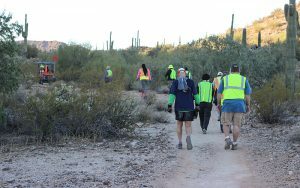 Throughout the day, hikers and bikers thanked the volunteers as they passed between pickaxes and shovels. Bunnell praised the progress they’ve made.